selling uniforms, badges and handbooks etc. developing promotional material and Guiding publicity for local use. In addition to these direct services they liaise with non-Guiding bodies, for example other youth organisations, Government departments, Government House and community groups. The SGGOs implement decisions made at various committee meetings and ensure appropriate information is cascaded to Region Managers and beyond. They administer the State finances including payments, invoices, receipts and reconciliations. The way these services are organised at State level differs but in broad terms there are teams responsible for: membership / administration, marketing / design/ PR, finance, property and merchandise / retail. 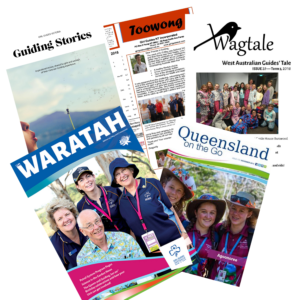 All States have a shop or retail unit which sells for example: formal and informal uniform items, books and publications on a range of Guiding related subjects, program resource materials, badges, souvenirs, certificates and gifts. Purchases can be made over the counter, by mail order, phone, fax or online. In addition most of the States operate a mobile shop. Some States have a library or resource centre which contains books, magazines, ideas for programs and materials for activities. It may be possible to borrow outdoor equipment from State Offices or in larger States from within the Region. Check with your State to see what resources they have and how you can access them. Most States have an archivist and can make old uniforms and memorabilia available for displays and/or hire at special events. It may also be possible to request scanned copies of historical materials. ’s area which is accessible through log-in and password details. The website addresses are set out in the Resources section. In addition, GGA and each State / Territory has a Face Book page for Leaders, although currently some only operate for special events. All States are developing their social media presence and use of e-news.